Stylised Dates. 50 Personalized Calendars starting Rs 11000. Name calendars are an excellent way to embed yourself in the memory of the recipient. It’s also an excellent tool for motivating oneself. Imagine the clouds in the sky in the form of your name, or flowers in a lawn forming your name; this level of personalization is bound to elicit positivity and memorable vibes. Designed specifically for the recipient, these calendars serve well to improve relationships and build trust. While calendars can easily be a boring affair, PrintStop aims to change that by providing easily customizable calendars, online. So let the special people in your life know that you care for them, all year round! A personal touch to something as simple as a name calendar helps you develop a long lasting relationship with your clients. The calendar usually comes with 13 pages and are of size 6” and 9”. All the pages can be personalized with images wherein the name of the recipient can be embedded. All you need to do is simply select a template for each month and upload it with the names that need to be printed. 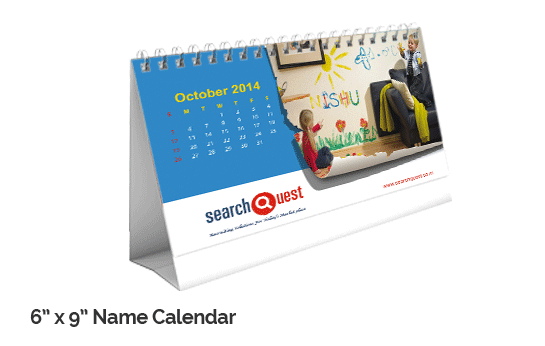 The name calendars create a lasting impression on your clients. With PrintStop, you can upload name calendar design or customize one with your own personalized touch.